My name is Sarah Maye and I am 43 years old, I am married to a wonderful man called Kevin and have two grown up children Liam who is 21 and Emma who is 16. We all know someone effected by Cancer and for me this really hit home when in November 2013 I was given the news that turned my world upside down when I was diagnosed with Stage 2 breast cancer, 2 operations, 6 rounds of chemo, 20 session of radiotherapy and 5 years of hormone therapy. The utter devastation it caused for me personally and my family and friends is indescribable but we all dug deep and together we decided there was 2 options – 1. Role over and take it or 2. Get up and fight it and there was only one option, so together we battled. In August 2015 I became involved with the Doncaster Cancer Support Drop in which was founded by a wonderful lady and dear friend Marie Caygill whom I met whilst under going chemo. 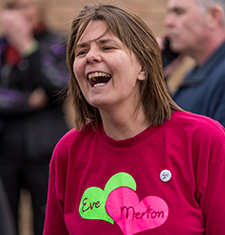 It was at one of the drop in sessions that I found out about the Eve Merton Dreams Trust. 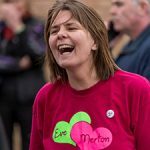 Marie and I often talked about our hopes and dreams and one of mine was to hold a Pink Themed party to thank everyone who had supported me and given me the strength to carry on when I felt there was no point, to continue to raise awareness into Breast Cancer and to Celebrate life. My dream was fulfilled in October 2015. The feeling that I got from the evening was amazing and I immediately knew I wanted to be part of the team. It is a privilege and an honour to come on board and I look forward to working with the team and the people of Doncaster, to give them the opportunity to escape even if for just a short while from the nightmare there are living in and to give them something to smile about.